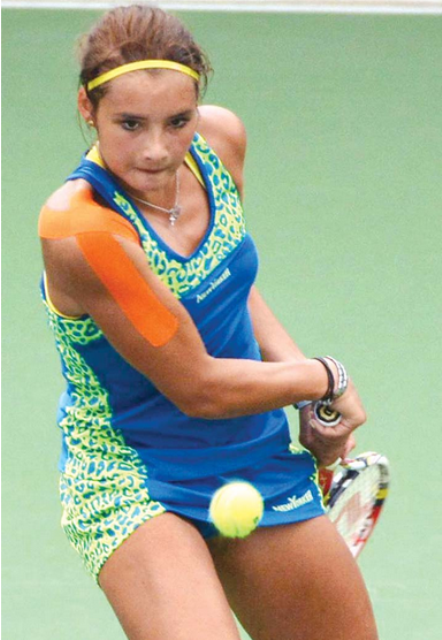 MANILA — Second seed Filipino-German Katharina Lehnert fought back from a first-set deficit to reach the singles final of the International Tennis Federation (ITF)-Thailand Women’s Pro Circuit on Saturday. The 22-year-old Lehnert, who was born in Brauschweig City in the state of Lower Saxony in Germany, pulled off a 6-7(5), 6-0, 6-1 victory over third seed Chinese Guo Hanyu in their semifinal encounter at Hua Hin’s True Arena hard court. Ranked No. 515 in the world, Lehnert will meet unseeded Chinese Li Yuxian in the championship round where the winner will earn USD1,568 while the runner-up will get USD980. Li defeated sixth seed Nudnida Luangnam of Thailand, 7-6(6), 6-4. On her way to the final, she eliminated fourth-seeded compatriot Zhao Di in the first round, 6-3, 7-6(4), and No. 5 Thai Bunyawi Thamchaiwat in the quarterfinal, 1-6, 6-4, 6-2. The 19-year-old Li is making her second final appearance since losing to Australian Abbie Myers in the fifth leg of the ITF-Egypt Circuit two years ago. Meanwhile, the top-seeded pair of Thai Nudnida Luangnam and Chinese Zhang Yukun won the doubles title after posting a 6-2, 6-3 victory over second seeds Chinese Guo Hanyu and Lu Jiaxi. Luangnam and Zhang shared the USD637 cash prize while Guo and Lu received USD343.